We could see Fort Sumter from the Charleston, South Carolina, shoreline. We just had to squint a bit. Yep—there it was, a small, low-lying silhouette on the outskirts of the harbor. 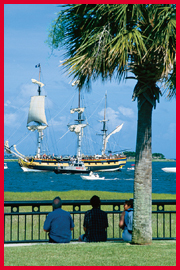 There are many reasons to visit Charleston. Great food. Interesting museums. Singular architecture. Great golf nearby. Minor league baseball. Beaches. A small but vibrant arts scene. Some unique (and not so unique) shopping. But, history itself is the most compelling reason to come. At least it is in the eyes of this history teacher’s son. And, iconic Fort Sumter best embodies the scope of Charleston’s role in history. and, of course, the place where the Civil War’s first shots were fired. The Confederate Army needed just 34 hours to win the fort. The Union Army needed four years to take it back. We overran its grounds after a 15-minute boat ride. All this history. Yet, the kids wanted to see the guns. And, why not? 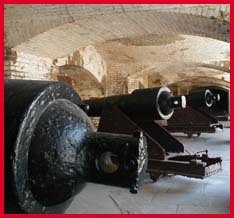 Canons were arrayed and displayed as if still ready to fire on any hostiles who might arrive. Next door to the Fort Sumter boat dock at Patriot’s Point, stands the South Carolina Aquarium. We sashayed over. Aquaria never get old. Or repetitive. No matter how many we’ve visited. I mean, what child (or adult, for that matter) gets tired of observing the odd-looking creatures harbored in the deep? Not to mention the cute ones. Or the ones with funny names like the Spanish Hogfish. 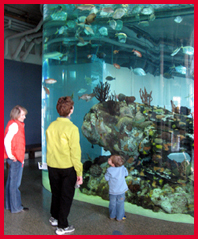 This aquarium focuses on the region. The main hall is devoted to the Carolinas’ coast, and there are standing exhibits on the mountain waterways, the Piedmont and a salt marsh aviary. Of course, there’s a touch tank, a most popular attraction with kids of all ages. Me, I like to stare in wonder at the jellyfish. (Did you know that moon-jellies have no brain?) And, people of all ages and sizes flock to the tanks to ogle sharks. Speaking of ogling, we took a moment on the outdoor deck to admire the Ravenel Bridge, North America’s longest single cable-stayed span, adorned with modernist, spider web-like cables, and to watch the heavy ships heading in and out of port. Charleston, it turns out, operates the fourth largest container ship port in the U.S. Who knew? You can rent a bike at Patriot’s Point and peddle across the bridge. We meant to do that. Charleston’s a pretty bike-friendly city, but we went a-walking instead. Charleston’s a great walking city. The distances aren’t that great between attractions, and the architecture stretches over its full 300-year history. 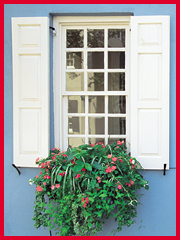 Every block in the Historic District overflows with architectural interest, resulting in a fascinating collection of classic Georgian, Federal, Adamesque, Greek Revival, Italianate and Victorian buildings. And, then, there’s the Charleston "single house." When I first saw one, I thought, "What the heck...?" The houses are but a single-room wide and face sideways to the street. Why? The answer was supplied when we joined a Charleston Strolls walking tour. Tour leader Evelyn explained: single houses were built sideways to better catch the summertime cross breezes in the days before air conditioning. The street door leads not indoors, but to a two-story, open piazza (or porch). From there, the inside is reached by a center hall. More anecdotal historical information supplied by Evelyn included the city’s being founded on tenets of religious tolerance, and the fact that it was among the first cities to legislate historical buildings preservation. 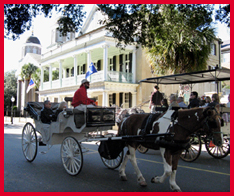 If your child isn’t given to long walks, a horse-drawn carriage tour is probably best. They’re easy on the feet, and kids love horses. Me, I need the exercise. You can spend a lot of time in Charleston’s museums. We did. Themes run from history and maritime to art and even the U.S. Postal Service. 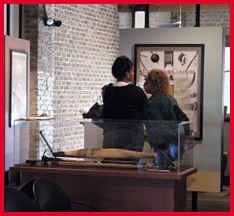 The Charleston Museum offers an excellent overview of local history, plus special art and crafts exhibits. Boys will no doubt like to check out the recreation of the H.L. Hunley, a sunk Civil War submarine that’s been recovered and is being restored nearby. The Children’s Museum of the Lowcountry will keep kids entertained, especially on rainy days. And, military buffs find the American Military Museum, with its paraphernalia and miniatures covering all America-involved wars, a must. Among them all, the Old Slave Mart Museum is a must-see. Small, it’s set in the building that served as a major slave trading market prior to Emancipation. Sobering? Yes. Edifying? To be sure. Speaking of markets, you can’t really visit Charleston without stopping at the Old City Market. Stretching several blocks along South & North Market Streets (wonder how those streets got their names...), the old, brick-faced buildings, headed by a columned Greek Revival head building, contains a panoply of stalls selling touristy souvenirs, trinkets, so-called collectibles, jewelry and beautiful, handmade sweetgrass baskets. Frankly, much of the wares were no more remarkable than any local flea market. But, you’ve gotta love the atmosphere, and the sweetgrass basketry made it worthwhile. For a modern marketplace experience—and for those who must—King Street is rife with shopping of all kinds, from name brand chain stores to local artisans and even a doggy bakery. Better, we thought, is the weekly Charleston Farmers’ Market staged on Saturdays from mid-April through November. Sure, there’s fresh produce on sale like any farmers’ market, but it’s also a great place to listen to music, eat lunch and discover great local crafts. At some point it’s necessary to leave the city and tour a classic southern plantation. Why? Because it was plantation life that defined not only the South, but all of America, economically and socially for all of the country’s formative years. The area holds four major plantations. The hard part is deciding which one(s) to visit. 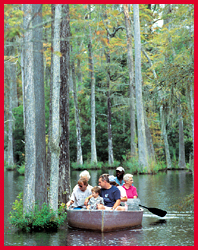 We chose Magnolia Plantation largely because it offers nature train and nature boat tours, and has a petting zoo. Not to mention beautiful gardens, and a very cool Audubon Swamp Garden that’s explored on a boardwalk walking path. Did you know that alligators can go for months without eating? They don’t eat at all in winter. Of course, that doesn’t mean you want to go swimming with them—even in February. History, museums, plantation tours, carriage tours—I can just feel your child starting to squirm. No worries. Get ‘em outdoors and let ‘em run around. The county park system offers almost anything recreational: playgrounds, water parks, an equestrian center, ball fields, climbing walls, dog parks—you name it. Or just take ‘em to the beach. There are plenty within spitting distance. Just plan to stay longer than a couple of days. There’s that much to do.